Raleigh gutter cleaning is one of the most often-overlooked but crucial aspects of home maintenance. Water weighs about eight pounds per gallon, and if you don’t have your gutters cleaned, this weight can start to either break your gutters or leak into your house, causing wood rot, basement flooding, siding damage, and a host of other problems. While Premier Property Services offers gutter repair, wood rot repair, and siding repair, an ounce of prevention is worth more than a pound of cure. 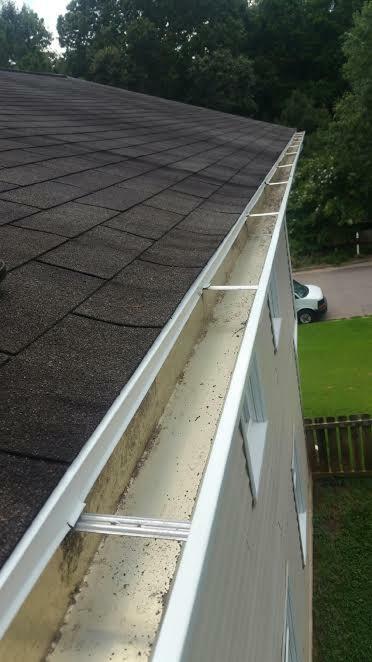 For this reason, we are proud to offer yearly maintenance on your gutters to ensure you avoid these costly issues. If you are merely seeking a single gutter cleaning in Raleigh, we also offer one-time gutter cleaning services. Automatic Scheduling: No need for you to ever call to schedule future appointments. Thorough Cleaning: Our team will remove all debris from your roof, gutters, and downspouts. Clean downspouts are just as important as clean gutters. We clean it all and leave no mess behind! Care for your Property: We use ladder stabilizer bars to prevent our ladders from ever coming into contact with your gutters. This ensures your gutters are never bent or scratched. Full Inspection: We thoroughly inspect your entire gutter system for any areas in need of attention and repair. Repairs: We will provide you with a detailed report and estimate to fix any problem areas found during our inspection. At Premier Property Services, customers often ask us similar questions about the health and state of their gutters. Given that, we decided to write a frequently asked questions page, so people can learn the answers to their questions about gutter maintenance and gutter cleaning in Raleigh. 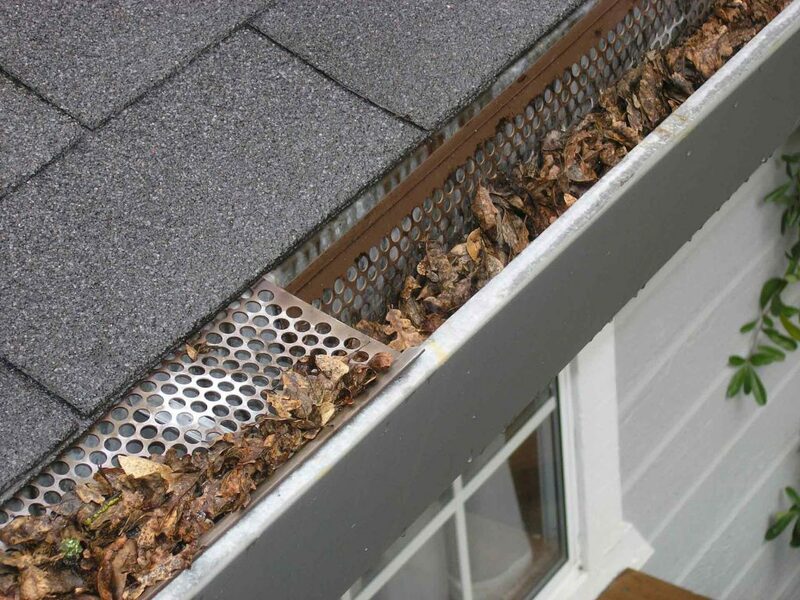 Raleigh gutter cleaning is a service that is highly dependent on the location of your home on your property. Raleigh is known as the City of Oaks for a reason, and that reason can often be found clogging up gutters in Raleigh. Premier Property Services recommends a baseline of two gutter cleanings a year, one in late spring and one in late fall. This will allow us to maximize the amount of debris we remove from the gutters while minimizing service time. However, there are certain homes for which two gutter cleanings a year will not do. If you are surrounded by trees as many homes are in Raleigh, we would recommend three or even four cleanings a year, just to avoid the cost and damage of your gutters flooding or breaking. What Happens If My Gutters Are Clogged? When your gutters get clogged with leaves and other assorted detritus, two things happen. Immediately they lose nearly all of their effectiveness as the water is not directed away from your foundations and siding, but is instead leaking directly on to them, causing siding damage, wood rot, and even foundation damage. In addition, water is heavy, weighing eight pounds a gallon. This weight can start to pull your gutters from the side of your house, causing damage both to the gutters themselves and to the siding on which they’re mounted. If you wait long enough and it’s a particularly rainy season, your gutters can even come off entirely. This can be exacerbated by water freezing, causing ice dams and other jams to threaten your gutters. How Can I Tell If My Gutters Are Clogged? Unless you want a very expensive maintenance job on your hands, keeping your Raleigh gutters cleaned is of the utmost importance! The length of time it takes to clean gutters in Raleigh depends almost entirely on the size of your house and the size and complexity of your gutters. For smaller, simpler houses with simple gutters, Raleigh gutter cleaning can take as little as 20 minutes. However, if you own a larger house with gutter guards and a more complicated system, gutter cleaning can take much longer. Why Shouldn’t I Clean My Own Gutters? While the actual task of cleaning gutters isn’t as difficult as some other home improvement, standing on a ladder, using the right chemicals to not kill the grass, not making a mess, and all of the other smaller parts of making a fully successful project are something that only comes with time. Instead of risking damage to your house, injury to yourself, or just a gigantic mess, hire the professionals at Premier Property Services! Contact Premier Property Services to Get Your Gutters Cleaned Today! If you need gutter cleaning, it is always better to get it done now rather than later. If you let water or debris sit in your gutters, it can cause numerous problems for your house that will cost much more to repair than a simple gutter cleaning. If you want to prevent long-term damage to your house then don’t wait! Call us or contact us online today to sign up for our annual gutter maintenance program and leave the rest to Premier Property Services, your number one gutter cleaning company in Raleigh!